For the past 4 years since leaving Falmouth University Susan has been gradually working towards establishing a place for herself within the printmaking world. 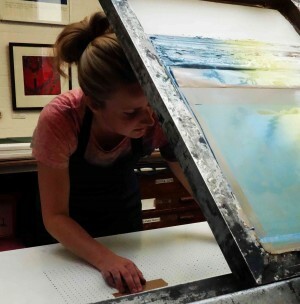 Initially trained as an etcher and lithographer Susan has turned her hand to many printmaking methods including letterpress, lino and now works primarily in screenprinting on paper and fabric. Susan works part time as the studio coordinator at East London Printmakers and spends the rest of her time designing and printing her own projects.